This one-day event brings together iwi, business and community leaders as well as environmental and biosecurity/biodiversity leaders. Guests will hear inspiring stories and case studies, be involved in interactive workshops and work with like-minded people in a creative, collaborative and innovative space. The aim is to form a leadership group to begin the journey to “building a biosecurity team of 4.7 million”. 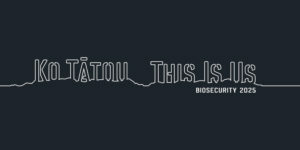 Biosecurity Minister Damien O'Connor will launch Tauranga Moana Biosecurity Capital at this event. There is no charge to attend this symposium. To register please email info@kvh.org.nz.